Escape from content mills and get your own well-paying clients! Before I became a full-time, self-employed freelance writer I read a lot on the subject. I wanted to feel prepared and not have any nasty surprises, so I consumed as much information as I could find in advance. One thing that I read again and again was that, as a freelancer, you have to be constantly marketing yourself but for some reason the reality of this didn’t sink in. I was building myself a website – that was marketing, right? And I could email companies to see if they needed a writer, so that was my marketing covered. Or so I thought. What transpired was that what I had read was right and my vague plans were severely lacking. I had planned to find some of my work on various freelancing websites, but that was before I saw that the fees that most of them pay is, frankly, insulting. This meant that I was even more in desperate need to market myself. The fact is that having a website is not enough, and sending the odd email to a company on spec will mostly result in very few responses, and even fewer actual work commissions. Instead, you need a consistent, targeted marketing plan because, otherwise, nobody knows you exist. The key to success as a freelance writer is to build good relationships with various clients: some of them will place repeat orders while others just need one piece of work such as a website rewrite. I started to target very specific companies in one of my specialist niches and I also later started to target businesses local to me. I did this by a carefully designed email campaign, and postcards specific to the audience I was aiming for. I also started attending networking events to meet other business owners in person. As a typical self-effacing Brit, I found it rather mortifying to promote myself in such a blatant way. It helps to think of it as marketing the business rather than myself, but it still makes me cringe. Even when work comes in and you are busy, if you do not keep the marketing going you will find yourself short of work again in a couple of weeks. It is no exaggeration to say that it is relentless, and sometimes it feels utterly pointless as well. Other times, inexplicably, the same approach pays dividends and enquiries flood in. Marketing your services as a freelancer can feel very much like throwing 100 balls into the air and trying to guess which two will be caught. I am sure that, over time, I will be able to throw fewer and get more catches but so many factors come into play that it feels impossible to tell. Who was it who said, “Half of my advertising budget is wasted, I just don’t know which half”? If you are planning to start a career as a freelance copywriter, do not underestimate the effort and energy you will need to put into promoting yourself and your work. A website is key, but on its own it does very little. Think of creative ways to make people aware of what you can offer them. Next, do those things and repeat the ones that are successful. And repeat. And repeat. And repeat. 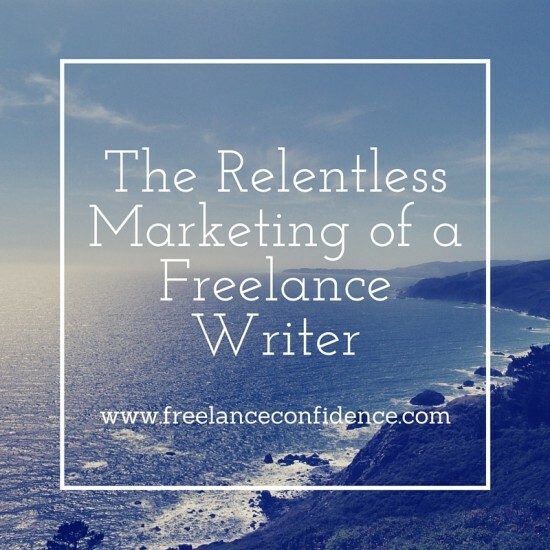 Share the post "The Relentless Marketing of a Freelance Writer"
Add me to the mailing list, too!